Marcia Bernicat delivers remarks after being sworn in as U.S. ambassador to Bangladesh during a ceremony at the U.S. Department of State in Washington, D.C.
Marcia Bloom Bernicat ’75, U.S. ambassador to Bangladesh, will be the principal speaker at Lafayette’s 183rd Commencement on May 19 and will be awarded the honorary degree of Doctor of Public Service. Also receiving honorary degrees at Commencement will be James Goldman, known to the public as Jim Gardner, anchor of Channel 6 Action News in Philadelphia; Eric Holder, 82nd Attorney General of the United States, and Beth Mowins ’89, play-by-play commentator for ESPN and CBS. Bernicat became ambassador to Bangladesh in February 2015, following her nomination by President Barack Obama and confirmation by the Senate. 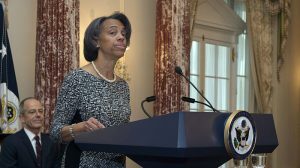 Other senior diplomatic positions she has held include U.S. ambassador to Senegal and Guinea-Bissau, deputy chief of mission in the U.S. embassies in Malawi and Barbados, and principal officer in the U.S. consulate in Casablanca, Morocco. Bernicat served as desk officer for Nepal and India in the Bureau of Near East and South Asian Affairs from 1988 to 1990. Following a year of graduate study in South Asian affairs at University of California-Berkeley and a year of Hindu-language study, she served as deputy political counselor at the U.S. embassy in New Delhi from 1992 to 1995, then as principal officer at the U.S. consulate in Casablanca from 1995 to 1998. She was deputy chief of mission at the U.S. Embassy in Lilongwe, Malawi, from 1998 to 2001, then deputy chief of mission at the U.S. Embassy in Bridgetown, Barbados, from 2001 to 2004. From 2004 to 2006, she was the senior-level director and career-development officer in the Bureau of Human Resources. She served as office director for India, Nepal, Sri Lanka, Maldives, and Bhutan in the Bureau of South Asian Affairs from 2006 to 2008. She served as ambassador to Senegal and Guinea-Bissau from 2008 to 2011. Following that posting and before becoming ambassador to Bangladesh, she was deputy assistant secretary in the Bureau of Human Resources from 2012 to 2014. A history major at Lafayette, Bernicat joined the State Department in 1981 after working at Proctor & Gamble for two years, then earning a Master of Science degree from Georgetown University’s School of Foreign Service. Early in her career Bernicat was a political/consular officer at the U.S. Embassy in Bamako, Mali; consular officer in Marseille, France; and special assistant to John Whitehead, deputy secretary of state. Bernicat is the recipient of numerous Department of State awards, including five Senior Foreign Service Performance Awards, two Superior Honor Awards, four Meritorious Honor Awards, and one Group Meritorious Honor Award. Gardner has served as anchor of WPVI-TV’s Action News telecasts since 1976. He will receive an honorary Doctor of Letters degree. He holds a Bachelor of Arts degree from Columbia University, where he had his first experience in broadcast journalism when he reported on the student riots at Columbia in 1968. Following graduation from Columbia in 1970, he worked at the all-news radio station WINS in New York. He joined WFAS radio in White Plains, N.Y., in 1972, and began his television career at WKBW-TV in Buffalo, N.Y., two years later. Holder was nominated to be attorney general by President Obama and sworn in by Vice President Joe Biden in February 2009. The College will award him an honorary Doctor of Laws degree. Holder majored in American history at Columbia College before attending Columbia Law School, where he clerked for the NAACP Legal Defense Fund and the Criminal Division of the Department of Justice. He joined the Department of Justice in 1976, assigned to the newly formed Public Integrity Section, tasked with investigating and prosecuting official corruption at the local, state, and federal levels. Mowins, an award-winning sports announcer and journalist, will receive an honorary Doctor of Letters degree. The national spotlight shone especially brightly on Mowins in September. She became the first woman to be play-by-play announcer for a coast-to-coast National Football League telecast when she called ESPN’s Monday Night Football game between the Los Angeles Chargers and Denver Broncos. The play-by-play voice of Oakland Raiders’ preseason games since 2015, she has called college football games on ESPN since 2005. An English major and two-time basketball team captain at Lafayette, Mowins was inducted into the Maroon Club Hall of Fame in 2005. She holds a Master of Arts degree in journalism from Syracuse University’s Newhouse School. She is one of five recipients to date of the Newhouse School’s Marty Glickman Award for Leadership in Sports Media, along with Bob Costas, Marv Albert, Sean McDonough, and Mike Tirico. The College Sports Information Directors of America honored her with the Jake Wade Award in recognition of her outstanding contributions to collegiate athletics.